Do you know what the law says? 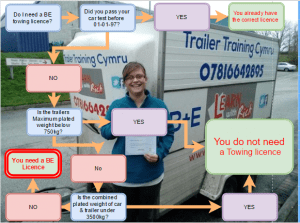 Then your have the BE licence to tow virtually any trailer that your vehicle is capable of towing. If you require more info then please use the links at the bottom of this page. First the good news YOU CAN TOW just not as much. The law gives you TWO options. 1, a vehicle up to 3500kg MAM (more on that term later) plus a trailer up to 750kg MLPM (later) to a combined 4250kg. 2, IF the trailer is over 750kg MLPM (even if empty) a vehicle & trailer combination that has combined MAM & MLPM of 3500kg or less. The main issue people have is for option 2. They assume that it is the real weight that is used. It is not. You MUST use the cars MAM & the trailer MLPM when adding up to see if you are under the 3500kg. DO NOT use kerb, weighed, loaded, MIRO, Googled, Matching sites or any other made up numbers. MAM Maximum Authorised Mass, ie the most it could legally weigh. You can find this on the vehicles weight plate. It will be the top number or on the V5c in section F1. 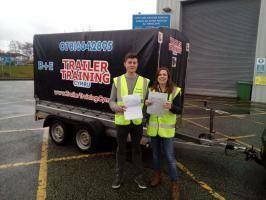 MLPM Maximum Legally Permitted Mass, this is the same as MAM above but for trailers. You will find it on the trailers weight plate. Even if the trailer is empty the fully loaded legal weight is used.